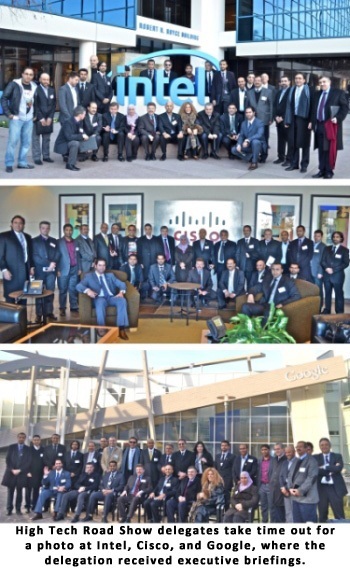 ARAB "HIGH TECH ROAD SHOW"
A senior-level delegation of nearly 50 Arab government and business leaders has just wrapped up its second stop -- to Silicon Valley in California -- during this year's High Tech Road Show. The two-day visit focused on the role of technology, innovation, and entrepreneurship as economic drivers in Silicon Valley and their potential applications in the Arab world. "Technology is playing an instrumental role in the changes that are sweeping through the Middle East and North Africa (MENA), raising the stakes and making clear that there can be no return to the status quo," said David Hamod, President & CEO of the National U.S.-Arab Chamber of Commerce. "In the forefront of this revolution are the youth of the Arab world, who understand better than anyone the powerful role that technology can play as a gateway to knowledge, job prospects, and a higher quality of life. With this in mind, our stop in California highlighted the remarkable business culture of Silicon Valley and explored whether comparable ecosystems could be created in the Arab world." Thirteen Arab nations are participating in this year's High Tech Road Show, which visited the International Consumer Electronics Show last week in Las Vegas. Following the visit to California, the delegates will travel to Washington DC for high-level meetings with a range of U.S. Government agencies involved in regulating telecommunications, fostering entrepreneurship, and promoting trade and investment. The visit to Silicon Valley was divided into three components: 1) A day-long conference that explored ways to promote economic growth and productive job creation in the Middle East and North Africa (MENA) region; 2) A VIP reception at The Tech Museum in San Jose that featured an exclusive tour of the world renowned traveling exhibition, "Ingenious Innovations: Islamic Science Rediscovered"; 3) Site visits to some of Silicon Valley's leading companies, including Intel, Cisco, and Google. High Tech Road Show delegates participated in a day-long conference entitled "Unlocking the Potential of the Arab Spring: Harnessing Technology and Innovation to Create Economic Growth in the Arab World." The gathering attracted more than 200 thought leaders from multinationals, small & medium-sized enterprises, academia, non-governmental organizations (NGOs), government, and the venture capital community. Co-organized by TechWadi, the National U.S.-Arab Chamber of Commerce, Plug and Play Tech Center, and IJMA3-USA (the Union of Arab ICT Associations), the event offered outstanding content and speakers. The conference consisted of six sessions focusing on such topics as "Success Factors of Silicon Valley," "Cultivating an Entrepreneurial Ecosystem - MENA Initiatives," "Enabling and Empowering Entrepreneurs," and "The Funding Imperative: Accessing Venture Capital." Some of the speakers included senior-level Arab government officials traveling on the High Tech Road Show. For example, H.E. 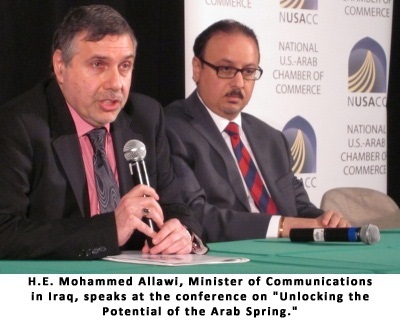 Mohammed Allawi, Minister of Communications in Iraq, noted that "opportunities are huge" in his nation. After decades of neglect, he suggested, the ICT infrastructure is now being overhauled to take advantage of the most up-to-date products. Partnerships with U.S. firms are welcomed, he said, for hardware, software, training, and a wide array of services, including the privatization of state-owned enterprises. ​Minister Allawi, participating in his first High Tech Road Show, noted, "The reason for our visit to the United States is to see firsthand the latest technologies, which we achieved through our meetings with leading international companies in Silicon Valley. I would like to thank the National U.S.-Arab Chamber of Commerce and IJMA3-USA for their extraordinary efforts in organizing the High Tech Road Show, which provided us with a unique opportunity to participate with a large number of our Arab brothers, on the one hand, and to visit leading companies in the tech sector on the other hand." H.E. Dr. Salim Al-Ruzaiqi, CEO of Oman's IT Authority, highlighted steps that the Sultanate of Oman has taken to expand broadband access in that nation and to bridge the digital divide. He cited Oman's strong IT infrastructure, beginning with an eGov program that enables almost all Omanis to communicate seamlessly with the Government of Oman. He also described tech centers that the government has set up to provide free training to all Omanis, which Dr. Al-Ruzaiqi characterized as an essential part of enabling small & medium-sized enterprises (SMEs) to participate actively in the digital society. With 65 percent of Oman's population 20 years old or younger, Dr. Al-Ruzaiqi suggested, his agency is working to align traditional education at the university level with skill sets needed for the workplace. 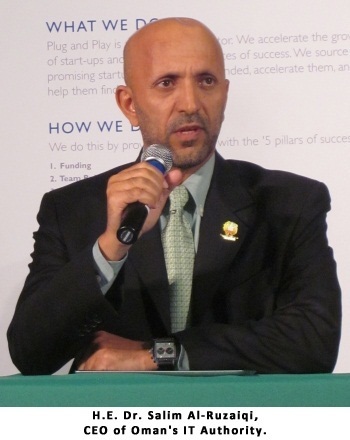 With a few months of training in Silicon Valley, he said, Omanis would be better positioned to bridge this gap. ​H.E. 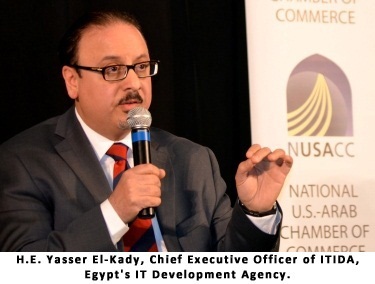 Yasser El-Kady, Chief Executive Officer of ITIDA, Egypt's IT Development Agency at the ICT Ministry, sketched out Egypt's rise to become the world's fourth most important center for IT outsourcing (ITO) and business process outsourcing (BPO). His ministry spends millions of dollars each year on talent development, he noted, which is one of the reasons why Egypt is qualified to provide outsourcing services in 16 different languages. Despite the disturbances of the Arab Spring, he suggested, Egypt remains a focal point for multinational companies doing business in the MENA region. Deputy Minister El-Kady highlighted the cooperative relationship that ITIDA has established with five universities in Egypt, including a nanotech program that funds the work of scientists in Egypt and has already spawned 22 patents. His agency is now assisting in the commercial development of these patents, El-Kady said, by connecting the patented products and processes to industry. ​Mr. 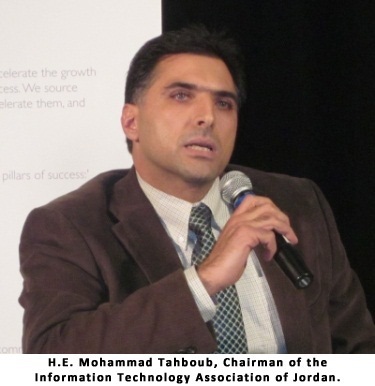 Mohammad Tahboub, Chairman of the Information Technology Association of Jordan (Int@j), discussed the role that Int@j has played in expanding Jordan's IT industry revenues from $200 million per year to $2.2 billion per year within a decade. The sector now employs 80,000 Jordanians and is responsible for 14 percent of the nation's Gross Domestic Product (GDP), he said. According to Int@j, approximately 70 percent of Arabic language content providers in the Arab world are Jordanian. Mr. Tahboub noted that approximately 5,000 graduating students per year go into the IT sector and that Int@j assists with mentorships between U.S. and Jordanian companies. With help from people like John Chambers, Chairman and CEO of Cisco Systems, Mr. Tahboub said, the mentorship program has grown from $1 million to $300 million within four years. The Int@j Chairman concluded with a quote from H.M. King Abdullah II of Jordan: "The place to invest is Jordan, and the time is now." One of the unique features of the day-long conference was that most of the speakers were Americans of Arab descent. In that regard, the event highlighted the singular role that first-, second-, and third-generation Arab-Americans are positioned to play in building a bridge to the "old country" during a time of widespread change in the region. As was evident at this conference, Americans of Arab descent who have been immersed in the culture of Silicon Valley are uniquely positioned to share their technologies and expertise with the Arab world. While in Silicon Valley, High Tech Road Show delegates participated in a VIP reception at The Tech Museum in downtown San Jose. The event drew more than 200 community leaders from around Silicon Valley, including top politicians. Delegates were treated to an exclusive tour of the world renowned traveling exhibition, "Ingenious Innovations: Islamic Science Rediscovered," which is making its first appearance in California. Also known as "Sultans of Science," the exhibition is designed to unearth the scientific know-how of an Islamic Golden Age, covering Muslim achievements from mathematics to navigation, astronomy, medicine, instrument making, fine utilitarian technology, engineering, optics, architecture and flight. 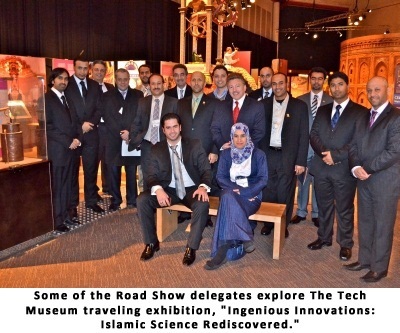 "The High Tech Road Show delegation was enthralled to know the scientific breakthroughs of a remarkable era, which was one of the greatest in the world," said Mr. Ludo Verheyen, CEO of Dubai-based MTE Studios, which designed and produced the traveling exhibition. "History books refer to the Dark Ages, when Europe slumbered, but few people are aware of the tremendous contributions that Muslim scholars made in science and technology during the Golden Age of the Islam (7th - 17th Centuries), which helped to pave the way for the European Renaissance." 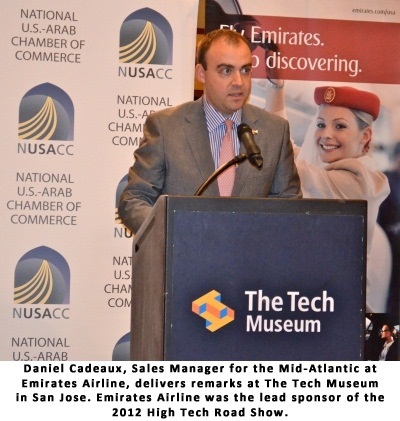 ​The lead sponsor of this year's High Tech Road Show, Emirates Airlines, was also the top sponsor of the VIP reception. Emirates currently provides non-stop flights from four destinations in the United States -- San Francisco, Los Angeles, Houston, and New York -- and the Dubai-based airline will launch two new destinations in the United States in 2012: Dallas, Texas (in February) and Seattle, Washington (in March). Emirates Airlines flies to over 100 destinations in 66 countries and has grown into the world's largest airline by passenger miles flown. In November 2011, at the Dubai Air Show, Emirates placed an order for 50 Boeing 777 jets -- representing the largest commercial order by value in Boeing's history. Including options to buy 20 more 777s, the total deal is worth $26 billion. Component #3: Site Visits to World-Class IT Companies. Site visits to world-class companies in Silicon Valley have always been an important part of the High Tech Road Show, and this year was no exception. 2012 Road Show delegates received high-level briefings from senior executives at three firms: Intel, Cisco, and Google. Intel Corporation highlighted its "World Ahead" Program, which enables governments to provide citizens with better access to technology and, by extension, a better quality of life. World Ahead focuses on five functional areas: Access - making technology more affordable and accessible; Connectivity - working with telecom companies to increase broadband connectivity; Content - supporting local digital content and applications; Education - promoting education and training through such programs as Intel Teach; Healthcare - expanding access to innovative healthcare solutions. In the spirit of creating jobs in the Arab world, education transformation -- a high priority for Intel -- was a focal point of the discussions. The "Intel Teach" Program, for example, helps teachers to integrate technology into their classrooms, thereby improving students' problem-solving, critical thinking, and collaboration skills. This is the world's largest and most successful program of its kind, according to Intel, with more than 10 million teachers trained in 70 countries. Intel is also well known for its annual International Science and Engineering Fair, the world's largest pre-college science fair competition. More than seven million high school students from around the world compete in local science fairs each year, and 1,500 of these young innovators become finalists, competing for more than $7 million in awards and scholarships. To date, according to Intel, there have been 33 Arab youth winners. Intel executives concluded the briefing by citing one of the firm's longstanding maxims: Every year, Intel gives more for less - more performance, but using less power and at lower cost. In a visit to the headquarters of Cisco Systems, High Tech Road Show delegates gained a better understanding of Cisco's view of ICT as a driver of economic development. According to the Cisco Visual Networking Index for 2010 - 2015, global Internet Protocol (IP) traffic will reach an annual run rate of 966 exabytes by 2015, representing a four-fold increase since 2010 at a compounded annual growth rate (CAGR) of 32 percent. Cisco calculates that a ten percent increase in broadband penetration translates into a 1.4 percent growth in a nation's GDP. Through the year 2015, Cisco sees four key IP drivers: 1) An increase in devices to nearly 15 billion connections; 2) An increase in Internet users to three billion; 3) A four-fold increase in broadband speeds; 4) More rich media content, equivalent to one million video minutes per second. According to Cisco, consumer Internet traffic will be dominated by Internet video, led by Internet-video to PC and followed by Internet-video to television and mobile units. This is especially true in the MENA region, which is expected to see an IP increase of 874 percent during the 2010-2015 period. Particularly impressive is the anticipated surge in mobile data traffic: a 63-fold increase over five years, with video making up nearly two-thirds (66.4 percent) of total mobile data traffic. Like Intel, Cisco places a very high premium on promoting education. Most famous among Cisco's educational programs is its Networking Academy, a global education program that teaches students how to design, build, troubleshoot, and secure computer networks for increased access to career and economic opportunities. Through more than 10,000 academies around the world, including 770 in the Middle East, Cisco has reached well over four million students and is processing more than one million online assessments monthly. Like so many other Silicon Valley ventures, Google -- like Intel and Cisco -- has very humble origins. In Google's case, it was a start-up, created by two Stanford University graduate students, that has grown to become a global player with more than 31,000 employees. During a presentation at Google, High Tech Road Show delegates learned that five percent of the world's population speaks Arabic, the fifth most spoken language on the planet, yet less than one percent of content on the Internet is in Arabic. This is testimony to the bilingual and trilingual capabilities of people throughout much of the Arab world, of course, yet it also speaks to the huge gap in content being created in Arabic. According to Google, 45 percent of Internet users in the MENA region use mobile devices to access the Internet. This is a reflection of many things, including, in part, the fact that the price of Internet access is 10-15 times higher in the Middle East than in the United States. With this in mind, Google's mission revolves around three features: access - including the ability to download videos locally and caching them for repeat downloads; sustainability - including the Student Ambassador Program, in which students serve as liaisons between Google and their respective universities; relevance - including the ability to produce programs that Google users find relevant at home and in the workplace. Innovation is at the heart of Google's success, and scaling this innovation takes place at three levels: transparency - keeping employees in the loop; agility - maintaining the ability to move forward quickly; and ubiquity - recognizing that innovation can come from anywhere. The creation of Gmail, for example, began with Google employees who were tinkering in the labs during some "down" time one afternoon. To maintain this spirit of innovation and close-knit relationships throughout the company, Google's leadership makes itself available every Friday to answer questions from the company's employees. Despite Google's phenomenal growth since its founding in 1998, much about the company, including its mission statement, remains unchanged: To organize the world's information and make it universally accessible and useful. One Silicon Valley leader who spent time with High Tech Road Show delegates was Dr. Mohammad Qayoumi, President of San Jose State University (SJSU) -- Silicon Valley's largest institution of higher learning, with more than 30,000 students. SJSU has the highest foreign student enrollment of all Master's degree institutions in the United States and claims to provide Silicon Valley firms with more engineering, computer science, and business graduates than any other college or university in the United States. A native of Afghanistan with five academic degrees, Dr. Qayoumi embodies the "can-do" spirit and entrepreneurial drive of Silicon Valley's immigrant communities. He summed up the High Tech Road Show's visit to California this way: "Silicon Valley is the cradle of creativity and epicenter of innovation. As the university that is powering Silicon Valley, San Jose State University's mission is graduating globally savvy and technologically fluent visionaries. Partnerships with delegations from the Arab world help us to achieve this vision and assure us that Silicon Valley will remain the place for dreamers, innovators, and high achievers."